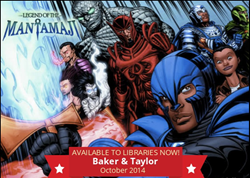 With the release of Book Two of the Legend of the Mantamaji graphic novel series, television director Eric Dean Seaton continues to appeal to superhero fans of all ages with multicultural characters and a thrilling, plot full of action and fun. Legend of the Mantamaji Book Two is available for pre-order ahead of its December 11th release, just in time for the holidays. People of color have been an afterthought in superhero and sci-fi/fantasy stories," television director Eric Dean Seaton said. "I always knew I wanted to create a comic book with a big back story and I wanted to create a superhero that looked like me. Superhero and comic book culture shows no sign of slowing down and with the announcement of more diverse characters on screen, parents of kids and teens who love superheroes are quietly hopeful the trend continues. The wait for a Black lead in a franchise film will be three years leaving parents still looking for quality media with heroes of color. Enter LEGEND OF THE MANTAMAJI, a three book graphic novel series by Eric Dean Seaton, top director of hit shows like TBS's "Ground Floor," NBC's "Undateable," Disney Channel's "Austin & Ally" and Nickelodeon's "Ricky, Nicky, Dicky and Dawn." Launched October 8th and available on all platforms, the series features African American male and female leads; a multicultural cast and strong storytelling from Seaton. Book One begins with hotshot Assistant District Attorney Elijah Alexander at the top of his career and the height of his selfishness. Little does he know his career success is directly connected to a secret that will put it in jeopardy. When a mysterious stranger appears, Elijah learns something incredibly shocking - he is not even human. Suddenly he has superpowers and is thrown into a world of magic, mystery and legendary evil. "I'm just like the rest of the comic-loving world - I'm excited for the upcoming Black Panther movie," Seaton said. "I'm a huge Black Panther fan, the comic was part of what inspired me growing up as a kid in Cleveland, Ohio. I always knew I wanted to create a comic book with a big back story and I wanted to create a superhero that looked like me. People of color have been an afterthought in superhero and sci-fi/fantasy stories. I also wanted to create a story that appealed to a wide range of comic book and graphic novel fans - that is why the book has no swearing and the story is layered and nuanced for adult comic and graphic novel lovers." “Legend of The Mantamaji,” a 2014 San Diego Comic-Con Exclusive, is perfect for comic and graphic novel enthusiasts, ages 9 and up. Book One of this three book series is on sale now, Book Two and Three are scheduled for December 10, 2014 and February 11, 2015, respectively. The book features artwork by Brandon Palas, colorist Andrew Dalhouse, who has worked with From Boom, Dark Horse, Image, Marvel and DC and lettering by Deron Bennett, who was nominated for an Eisner Award two years ago for his work on titles like Jim Hensons Dark Crystal, Jim Hensons Tale of Sand and Helldorado, among others. As an episodic director, he is a two-time NAACP Image Award nominee and has helmed over 38 different shows, 195 episodes of television, 18 music videos, two pilots for Nickelodeon, “Bad Fairy,” and “Sketch,” as well as two pilots for Disney XD, “Mighty Med,” which currently shooting its second season and “Kickin’ It,” which has completed its four year run.